I'm an ambient musician looking for an addition to my synth collection. I'm interested in the Quasimidi Polymorph, yet they are getting very old and hard to find. I was wondering what the modern-day multi-voice alternatives might be (preferably with a step sequencer), as it seems that many instruments are somewhat limiting. Would the Dave Smith Poly Evolver Keyboard be a good alternative? Also, I've never had a modern synth before — are they as repairable as old ones? 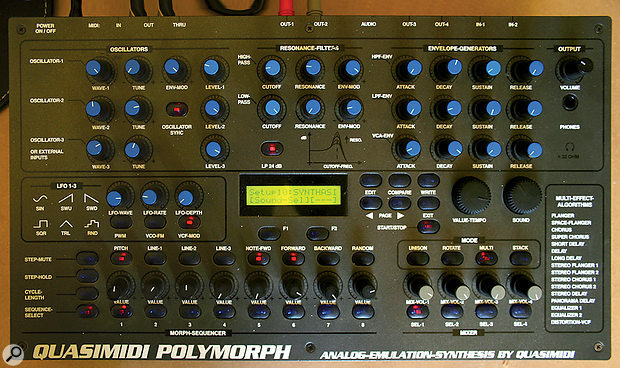 SOS contributor Paul Nagle replies: The Polymorph was the centerpiece of my live set for a few years, and it has a wonderfully direct interface and a simple but powerful step sequencer. It didn't sound anything special, though! As for the Dave Smith PEK, it's an alternative in the same way a nuclear missile is an alternative for a bow and arrow! Something closer would be a Tetra, although it hardly matches the Polymorph for hands-on, nor does it match the Polymorph's eight-/16-note polyphony. If polyphony doesn't matter, my recommendation would be to look at the Elektron Analog Four, which has four monophonic synthesizer tracks, effects and the capacity to drive a couple of external analogue synths too. It comes with Elektron's three-year parts and labour guarantee, which may ease your worries about repairs. Other synths to investigate include the Korg Radias and Radikal Technologies Spectralis 2. Sequentix Cirklon. There are many options: so many it can be bewildering. I'm quite a fan of Korg's Electribes, though maybe not so much for ambient music. However, if money were no object, I'd be looking at a Sequentix Cirklon combined with a multitimbral synth module or two. I'm not entirely unbiased (its developer is a friend of mine) but I know of no sequencer that screams 'creativity' quite so emphatically. As to whether old or new synths are more repairable past their warranty date, there's no hard and fast rule. Some older gear is packed with rare chips (ICs), hard-to-source DACs and other obscure parts, while other gear of a similar age may use very common components, or ones with obvious off-the-shelf modern equivalents. As an example, I recently found it easy to get my EMS Synthi repaired, but my much newer Emu Proteus 2000's dying power supply proved a failure too far. Just because a synth is more modern, there's no guarantee its parts will be available in 10 or 20 years. If you know a good tech, treasure him (or her) — these people are worth their weight in gold.